Building a Company is one of the few books that looks at Roy Disney’s life. There are a handful of biographies on Walt Disney; some are spectacular while some are misleading and almost reprehensible. In 1998, Bob Thomas, who also wrote the official biography of Walt Disney and several books about animation, penned the sole biography of Roy O. Disney. I read Bob Thomas’ biography of Walt many years ago and it is one of my favorites. Even though it’s an official biography and promotes many corporate truths, it’s still a great look at Walt. In 1998, Thomas published Building A Company, a look at the lesser-known half of the Disney Empire. Roy’s life started out simple enough and even as a young teenager, he was taking care of Walt and helping him with his dreams. This would be a consistent pattern throughout his life. Even after Walt passed, Roy postponed his retirement to see that the Walt Disney World project would be completed. He worked tirelessly to get Walt’s dream as close as possible. He felt he needed to take the mantle of creative and financial lead for the Company; that no one else would be able to follow through. This was a biography that was a long time coming. Every Disney historian understands how important Roy was to Walt. 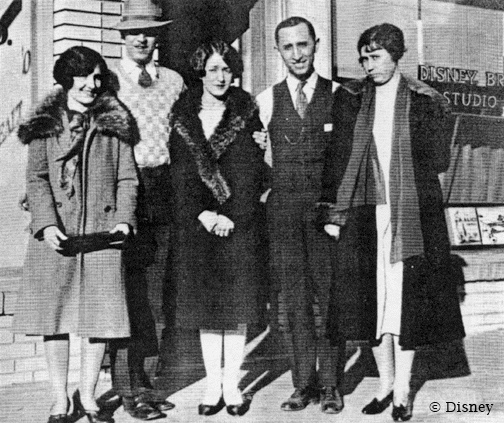 Without big brother Roy, we wouldn’t have the Disney Company as we know it today. Walt has been quoted as saying that without Roy, he would probably be in jail for bouncing checks. Building a Company brings Roy’s life to the forefront and paints a picture of a man that truly loved and understood his brother. Walt was always seen as the creative genius and Roy as the money man. After reading this biography, I can assure you that Roy was just as creative as Walt. Roy just used numbers, balance sheets and common sense. Thomas is able to share a Roy that was extremely ethical and treated all business partnerships with respect. Building A Company is a very enjoyable read that never suffers fact for narrative. Bob Thomas has written several other Disney-related titles and he was a reporter for the Associated Press for more than 50 years. As with any biography, you need to take bits and pieces with a grain of salt. Sometimes it reflects poorly on the biographer and sometimes with the prior research (and researchers). I didn’t run across anything glaring, but after doing some of my own research, I did see some inconsistencies across several biographies. It just serves to remind us that not every biography is conclusive, exhaustive or authoritative. Bob Thomas does take us a on a journey through Roy’s life, allowing us a glimpse of a strong man who always did what was in the best interest of the Company, even if he was at odds with Walt. Nonetheless, it is still the most complete look at Roy Disney’s life to date. This is a book that every Disney enthusiast should read. You can learn a lot about Roy Disney by reading everything about the company, or you can just read this book. (Although, I will recommend that you read everything!) You will appreciate this biography more if you have read Thomas’ Walt Disney: An American Original or Barrier’s The Animated Man: A Life of Walt Disney. Not that Building A Company is a companion piece, but Thomas spends more time focusing on Roy’s contributions and a larger familiarity with the Disney Company will benefit the reader. This is a great read. It should be read by every Disney enthusiast. Have you read Building a Company? Do you have a favorite Walt biography? A book I hadn’t really heard anything about – but now I’m intrigued and think I will have to try to find a copy to have a wee read of! About a year ago I was wondering why nobody had ever written a bio on Roy. Then I accidentallyn stumbled across it in the library. Even though you knew basically how the story would unfold, it was neat seeing it from Roy’s persepective instead of Walt’s. There’s two sides to every story. Thanks for the review! Keep up the Geekiness! I’ve often thought Roy’s story to be quite compelling. Talk about being “overshadowed!” We all owe Roy a great deal of gratitude, since Walt always admitted that he (Walt) would’ve bankrupted the place several times over if left to his own devices! This is a great book. It was the book to start my library of Disney. I was fortunate enough to find a signed copy of this book (by Bob Thomas and Roy E. Disney). It is a treasure in my library and it is a very good read. Combine it with Thomas’ “Walt Disney: An American Original” and you have a nice biography of the brothers Disney. Good call George! I’m in the middle of this book and LOVING it. It’s the perfect combination of storytelling and facts that I enjoy. I bought it after I read Realityland (which I saw here and enjoyed immensely) and it’s reaching me the same way. If you want more on WDW, try Kurrti’s Since The World Began. You will also like the Imagineering Field Guides. You should see if you can nab a copy of Beard’s Epcot Center. Be careful, though, there is a 127 page version (the small one) and two different versions of the larger one (both 240 pages). Sigh…so many good books out there! thank you so much for the book tips!! i will definitely try and get my hands on those books. I caught up with this book last fall and was fascinated by it. I was surprised that it included a lot about the friction between the brothers and felt very balanced for a Disney release. It also was an easy read and never dragged, which isn’t easy for a book of that size.